Nothing stays the same for long. When you live in a city changes are gradual; a slow shift of places to eat and things to see. When you've been away for 4 years you fully expect things to be very different. You don't expect your favourite places to be quite the same, the food to be quite how you remembered it. Food memory is a funny thing, with time dishes can seem even better than they ever were, more memorable, more evocative. So, it was with no small measure of surprise that I found many of the great places to eat that I remembered still thriving and many of them undiminished, even if the Sydney Morning Herald Good Food Guide didn't think so any more. When I'd first come to Australia in 2001 I'd lived in Manly and Le Kiosk (pictured above) up on Shelly Beach was were we went to treat ourselves. We were living a slightly backpacker lifestyle at first so those infrequent trips to the restaurant were quite special. The restaurant is stilll there, still busy and is still one of my favourite places to people watch in Sydney. People flow by jogging, walking with kids in strollers, dragging themselves out of the water sagging under the wieght of scuba gear or wearing unlikely looking speedos whilst you sit back and relax. I might have grown up a bit since I was last here, my tastes might have got all big and clever, but good quality fish cooked simply wins out and Le Kiosk does it competently and with a large dollop of nostalgia for me. 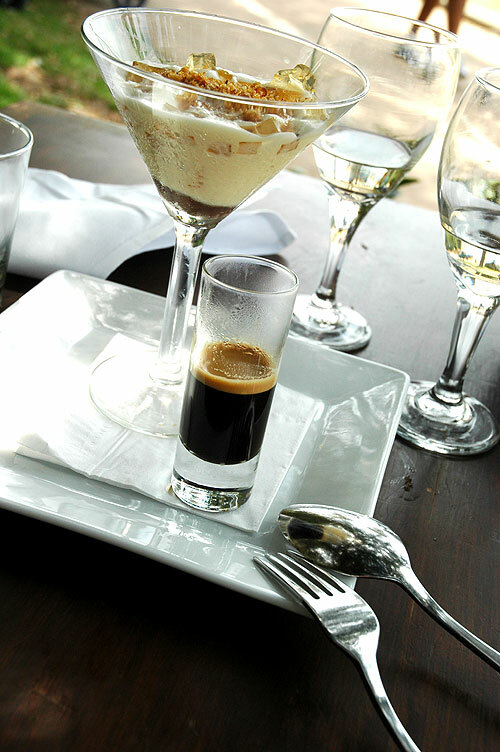 That and a supreb Afogato with Frangelico jelly. Say you are coming to Sydney and you'll get a great deal of advice about where to eat. It's probably the best thing about the city after the harbour views. It has a diverse and high quality restaurant scene, chefs are watched like hawks and thier movements commented upon as much as footballers in the Premiership back home. The big name chefs are mentioned in hushed tones of reverance. Tetsuya Wakuda, Matt Moran, now expat David Thompson, Niel Perry and shining star Mark Best of restaurant Marque are the topic of endless speculation. I had a long in depth discussion with a very beautiful hairdresser about the amuse bouche of quails eggs in celery salt at the now defunct restaurant Salt and the merits of Bill Granger's every expanding empire of Bill's restaurants and the fading of the once stellar BBQ King. Pretty much everyone knows thier food here. Talking of Bills, I went along like a good foodie and paid homage at the altar of Mr Grangers simple fare. I had the schnizel and potato salad like I was supposed to and it was all very good. Sydneysiders I spoke to tended to be a bit sneering about the place, from " Well, it's ok for brunch " to downright hostility and more than the odd comment casting aspertions regarding the man's heterosexuality, which I thought was a bit off since all he's doing is flogging some quite nice cook books. I like Bills, there's nothing wrong with it, it's simple. I was really looking forward to lunch at The Bather's Pavillion. I had some very happy memories eating there. Balmoral Beach is a peach of spot and one day after having a suspiciously old German doctor pronounce that I was fit enough to scuba dive in Australia I was in need of somewhere to celebrate. I jumped in a cab, even remembering to get in the front seat, as all good Australian males should. I walked into the place and was faced with a bit of a dilemma. On one side the spacious, cool simplicity of the restaurant, a glorious space that feels like an ocean liner in 1920's, or at least what ocean liner should be like in my head. On the other the carnage that was the cafe. I opted for the cafe. 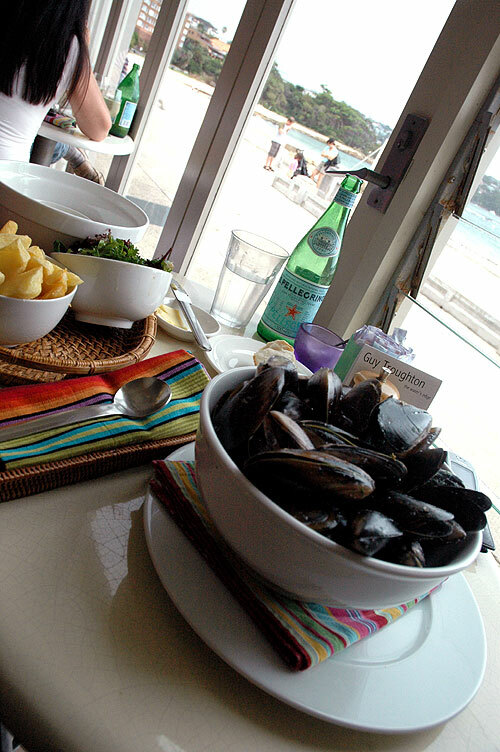 It took an hour and three quarters to serve me a very tasty bowl of mussels and a bottle of mineral water. I didn't mind that much, I had a book and the view is quite special but still. I gave up trying to get someone to get me a coffee, paid and went to the coffee stand they operate round the side of the building. Blue Ginger in Balmain is one of those places that holds so many happy memories for me that they could serve up thin gruel and I would probably be quite happy. There are a couple of dishes from the place that had taken on mythical status in my mind. The Salt and Pepper Squid there was something special and it was with some trepidation that I met a group of friends there. It still rocked my world to be honest. Crispy Skin Chicken, Barramundi with Ginger and Shallots and the squid were just as good as I remembered. Everyone said that the BBQ King had gone down hill. Everyone I spoke to said that this once gloious monument to pork belly was past it's best. The formica tables once feted by the likes of Rick Stien were lacking lustre. I went since I don't tend to believe most people, I'm a bit suspicious when everyone agrees. It wasn't mind blowing, it's wasn't the revelation it might once have been. It was still pretty good. They aren't doing anything different, I just reckon it's not that novel anymore. Pity. Brilliant pics Monkey. 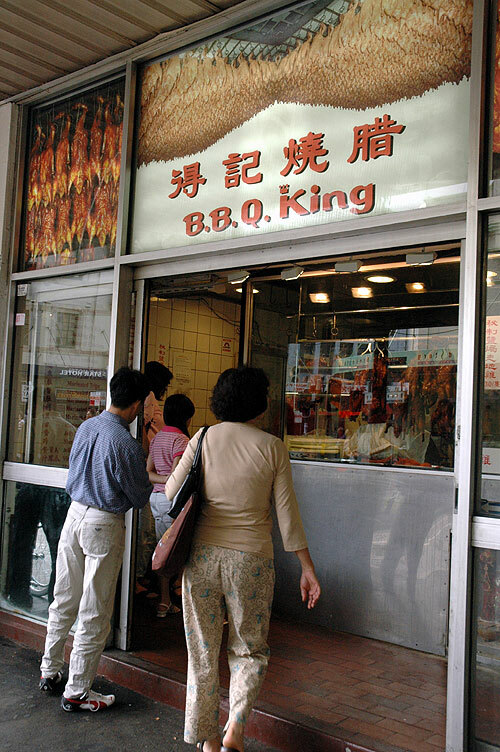 I was disappointed with BBQ King on our lst visit about 3 years ago.